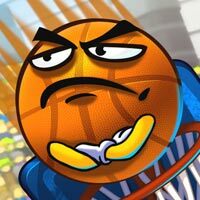 Basket & Ball Lets play Basket & Ball .Take on the role of the daring basketball and roll 'n' jump your way to glory in the cute physics-based puzzle game Basket & Ball. Your aim is to shoot yourself through the basket at the other end of each stage. Dodge obstacles, collect stars and become the champion.Have much fun and good luck.